Hi friends! Maddur Vade is a very popular snack of the state of karnataka, in India. Maddur Vade got its name from a little town called ‘Maddur’ which is situated in between Bangalore and Mysore. 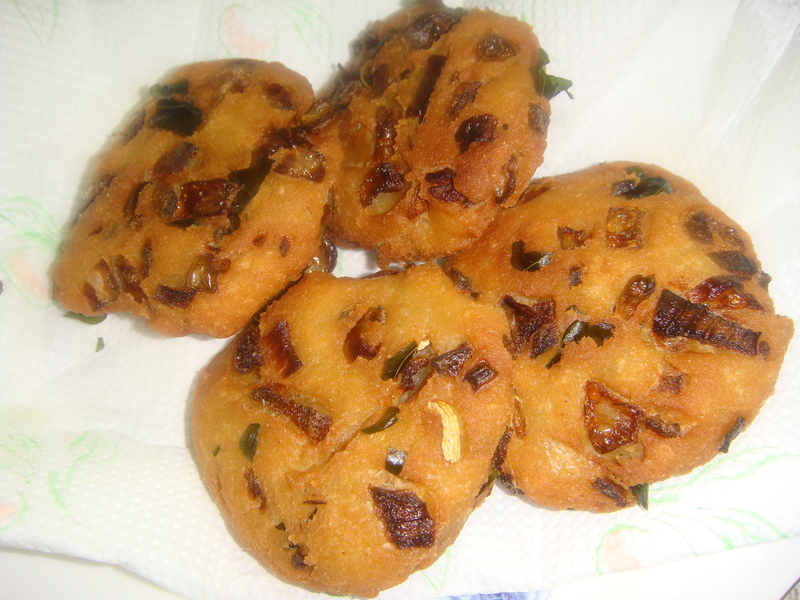 These delicious vade are a good for breakfast or evening snack and can be served with or without coconut chutney . Vade are easy and quick to make and have a crispy crust and soft from inside. Take all purpose flour, sooji, rice flour, salt in a bowl mix all the ingredients well . Sprinkle three table spoon of oil and rub the mixture with your hands so that it resembles bread crumbs and oil is fully absorbed. Now add onions, chilies, curry leaves to the mixture, adding water slowly make a firm dough. Cover and leave the dough for about 10-15 minutes. Divide the dough into equal lemon size balls.Pat and flatten the dough balls between your palms and set aside. Take the patted dough and slide it carefully into hot oil for deep frying. Fry these vade on low to medium flame. Fry the vade until they turns golden brown.Remove vade from the oil and drain them on a paper kitchen towel , keep them aside. Fry three to four vade at a time . Serve these hot vade just like that or with coconut chutney.